If you were planning on sitting around the house on Saturday night for a good old fashioned election party, don't. Well, maybe you could stick around if you're supporting a minor party and they're hovering perilously close to the 5 per cent threshold or near to getting another MP. Thanks to advanced voting we'll know the outcome as soon as advance voting results are released, which will be anywhere between 7:01pm and 8pm judging by past elections. As you can see above, with ever increasing numbers of people advance voting, the difference between the party vote from advance voting results and the final result has been quickly decreasing. Based on the current numbers of people advance voting relative to 2014, I've estimated we'll get around 1,560,000 advance votes this year (versus 717,579 in 2014), around a 118% lift. I'll keep updating this each day as new statistics come through from the Electoral Commission. What this means is that the advance voting result is increasingly similar to the final result. 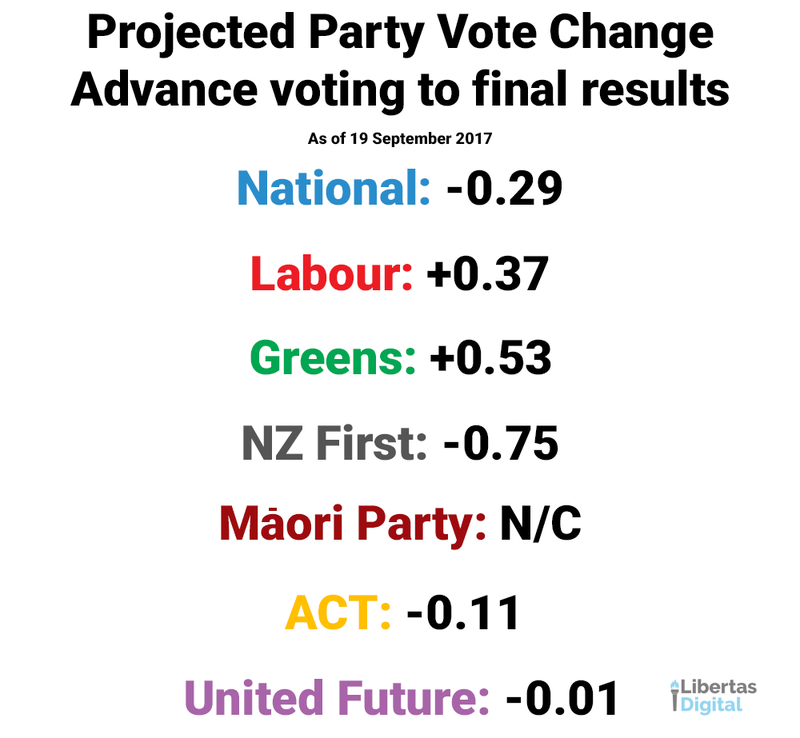 So much so that in 2014 National only dropped 0.81 points, Labour gained 0.64, the Greens gained 0.72, NZ First lost 0.47, the Māori Party lost 0.01, ACT gained 0.09, and United Future (who I've included purely because they had an MP in the 51st Parliament) gained 0.02. With that in mind, I've attempted to calculate what impact more than double the number of advance votes cast will have on the change between the two results by looking at the shift between 2011 and 2014, as well as trying to calculate in the impact of what is currently an 11 point difference in growth between 2011 and 2014 and 2014 and what 2017 is tracking at. (2014 had 129% growth on 2011, whereas we're currently looking at 118% for 2017). What you can see is that at most it might rob National of a seat, and grant Labour and the Greens a seat each. NZ First looks set to lose at least one seat, if not two depending on how close they sit to a factor of 0.6%, while for the Māori Party, ACT, and United Future, it's unlikely to make much difference, though it could cost ACT a seat if they're sitting just over 1.2%. Admittedly there might still be a bit of interest around certain marginal seats where the Māori Party is concerned that could create some fascinating outcomes, but it is largely the party vote that determines who will form the next government. Update 7pm 21 September: With the latest advance voting numbers in, my projection for advance voting turnout has dropped by 45,000 to 1,515,000. The reason for this is largely driven by a big slow down in advance voting yesterday relative to 2014. For the same day in 2014, advance voting increased 37% on the day prior. This year it only increased 9%. Across the final four days of advance voting in 2014 numbers really surged. This might be a one day aberration and we could see normal service resume tomorrow, but I can't see it increasing enough to even meet my ambitious projection. Assuming that the final two days also deliver 133,000 advance votes, we're looking at advance voting reaching around 1,070,000, so well short of the 1,560,000 I originally projected.